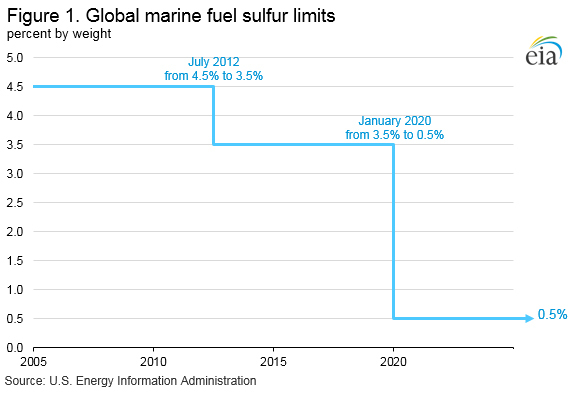 With a planned effective date of January 1, 2020, the International Maritime Organization's (IMO) new regulations (IMO 2020) limit the sulfur content in marine fuels that ocean-going vessels use to 0.5% by weight, a reduction from the previous limit of 3.5% established in 2012. The IMO adopted the plan for this policy change in 2008, and in 2016 reaffirmed an implementation date of 2020. 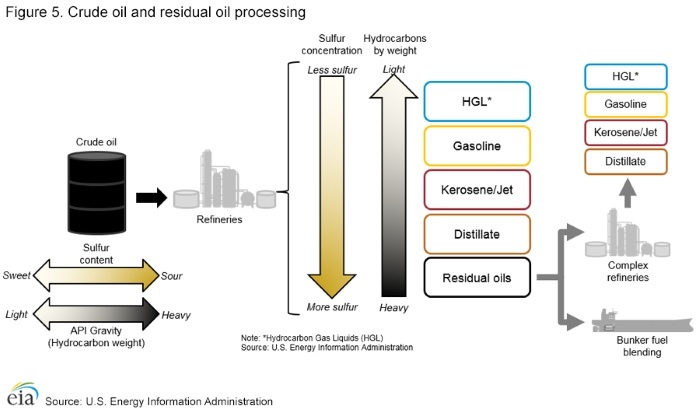 The change in sulfur limits has wide-ranging repercussions for the global refining and shipping industries as well for petroleum supply, demand, trade flows, and prices. 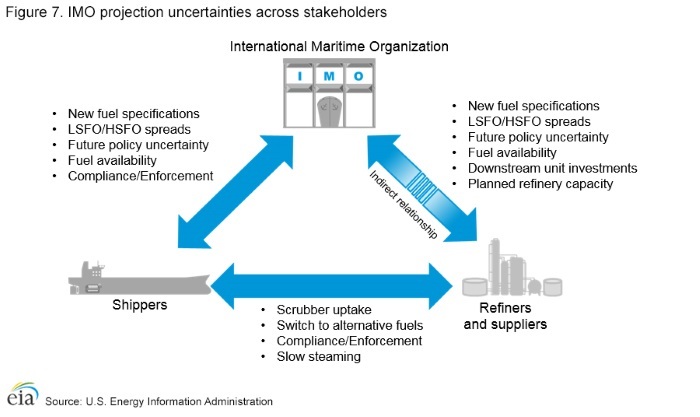 The shipping and refining industries have already begun making preparations and investments to varying degrees to accommodate IMO 2020 regulations. As the implementation date for the 0.5% sulfur cap approaches, the U.S. Energy Information Administration (EIA) expects that shifts in petroleum product pricing may begin as early as mid-to-late 2019. EIA anticipates that the effects on petroleum prices will be most acute in 2020, and the effects on prices will be moderate after that. However, the regulations will affect petroleum supply, demand, and trade flows on a more long-term basis. EIA shows the effects of these new regulations in both the Short-Term Energy Outlook (STEO), published monthly, and the Annual Energy Outlook 2019 (AEO2019), released in January 2019. Because IMO 2020 will affect petroleum markets across several years, EIA's STEO forecast and AEO2019 projections provide complementary insights into the effects of the regulations. Both STEO and AEO2019 are based on current laws and regulations. AEO2019 centers around a Reference case based on relationships and general equilibrium models that satisfy projected energy demand under a set of constraints. STEO provides forecasted data that are updated every month. EIA uses a combination of econometric models based on historical data to forecast where EIA anticipates energy markets will move in the next two years. The STEO relies on historical data, short-term trends, and analyst judgment in creating this forecast. Although the STEO forecasts fewer variables than the Annual Energy Outlook, STEO's publication frequency allows EIA to incorporate developments related to the IMO rule more regularly than AEO2019, which projects variables at an annual frequency through the year 2050. In addition, because the STEO is published monthly, EIA adjust its forecasts continuously to incorporate new information. Because the current STEO forecasts end in December 2020, the data in AEO2019 provide EIA's projections with insight into how IMO 2020 will affect petroleum markets beyond 2020. 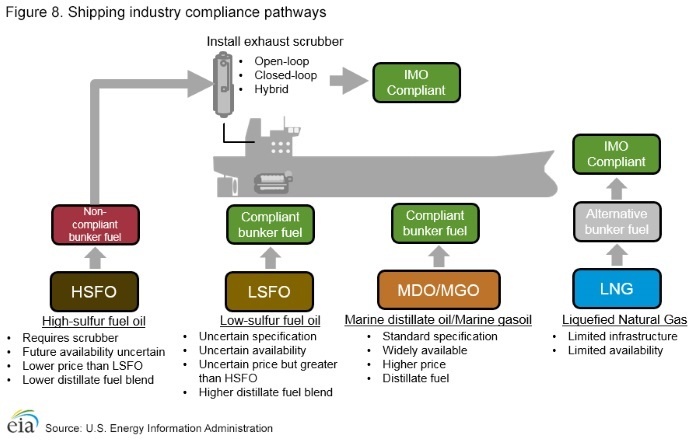 In addition, AEO2019 has more detailed data on refinery operations, marine fuel use, and fuel costs than the STEO. Projections in the Annual Energy Outlook are generated from EIA's highly detailed, structured equilibrium models in its National Energy Modeling System. The first section of this report explains the findings related to IMO 2020 from the STEO and AEO2019 analysis. The second section discusses the uncertainties that might affect the way that actual outcomes deviate from EIA's forecasts and projections.